Can A Space Heater Save You Money? Do you frequently use space heaters in your workspace or home? 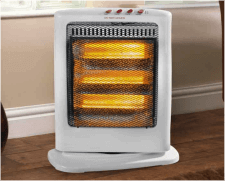 Small space heaters are generally used when the main heating system is inadequate or when central heating is too costly to install or operate. Contrary to popular belief, stocking up on these single-room heaters may not be the best option for you. While space heaters are believed to be an efficient way of heating a small space and saving a few bucks, this can't be further from the truth. Product ads state they are 100% efficient - Though this may be true, ads do not pass the test when analyzing variables like the size of a room or BTU’s. A lot of efficient electric appliances produce a certain amount of BTU’s and the cost per BTU can send your energy bill through the roof. Depending on the type of space heater you are using, it's possible that your home could fall victim to a carbon monoxide leak or even a fire. Either of these occurrences could be fatal to your family. The heating system in your home is built and sized correctly to keep you and your family comfortable. If you aren't staying comfortable and need to use space heaters, it's likely that you are neglecting maintenance on your furnace. Failure to keep your furnace in good shape will only cause it to lose even more efficiency or even break down entirely. Rather than buying a heater and paying to operate it, put that time and money into your home's HVAC system for ultimate comfort. If it's finally time to upgrade or install a new central air heating system, call Logan Services of Columbus, Dayton or Cincinnati, OH! We have quality HVAC systems and multiple financing options available for every home and budget!